Lettuce is the easiest vegetable to grow hydroponically. That’s why it’s a great vegetable plant for beginners to start with and used in so many hydroponic operations. Hydroponic lettuce grows fast, doesn’t take up much space and is easy to maintain. I prefer to start seeds in rapid rooter plugs to germinate my lettuce seeds. It’s best to sow a few seeds to increase the chances of getting a successful seedling and then thin, keeping the healthiest. Germination It only takes a few days for seedlings to sprout. After the seedlings rise above the starter cube, that’s when you pinch the heads off of the multiples, leaving the healthiest seedling. Make sure to pinch and not pull, or you may disrupt the root system of the seedling you’re going to keep. What Hydroponic Systems Works Best For Lettuce? Lettuce can be grown in many different types of hydroponic systems. On a commercial level, nutrient film technique (NFT) is the primary method used. Many at home hydroponic gardeners choose deep water culture and raft systems. For my hydroponic lettuce gardens, I use a variety of methods including water culture on a smaller scale, ebb and flow, and NFT systems. What Is The Best Temperature For Hydroponic Lettuce? Lettuce is a cool weather crop. It grows best at temperatures between 45 and 70 degrees, going from warmer during the day to cooler at night. If your hydroponic lettuce gets above the 70-degree range it will bolt, which means they start to go into the flowering phase of its life cycle. Lettuce that has bolted has a bitter taste and is not very good for eating. Different varieties require different spacing. I found that in most of my gardens about 6-8 inches apart works well. Loose leaf varieties you can put a couple of inches closer together. Lettuce that forms a firm head should be placed about 12 inches apart to allow for fuller development. Lettuce has shallow root systems so they don’t require a deep grow bed. How Much Light For Lettuce Production? Lettuce does not require a long duration or intense amount of light to grow. Hydroponic lettuce should get between 10 and 14 hours of light per day. Since lettuce doesn’t need intense light, you have several lighting options. Many growing hydroponic lettuce opt to go with fluorescent lighting due to the minimal initial investment, low power consumption, low heat production. The recommended pH level for hydroponic lettuce is 5.5-6.5 . Lettuce requires an n-p-k ratio geared towards the vegetative stage. Since we don’t need lettuce to flower to consume it, you can use the same type of nutrients up until harvest. Lettuce does well with nutrients higher in nitrogen and phosphorus and has less of a need for potassium. I personally use Dyna-Gro Foliage Pro nutrients for growing my hydroponic lettuce. How many days it takes until you can harvest your lettuce depends on a couple of factors. First, it depends on what variety you’re growing. Loose leaf and bib lettuce can take anywhere for 45-55 days. Romain and take up to 85 days. The second factor has to do with preference. Growing indoors allows you to control the environment and extend your harvest. You can harvest when you’re ready to eat, let it grow back, then harvest it again. This is called the “cut and come again” method of lettuce harvesting. 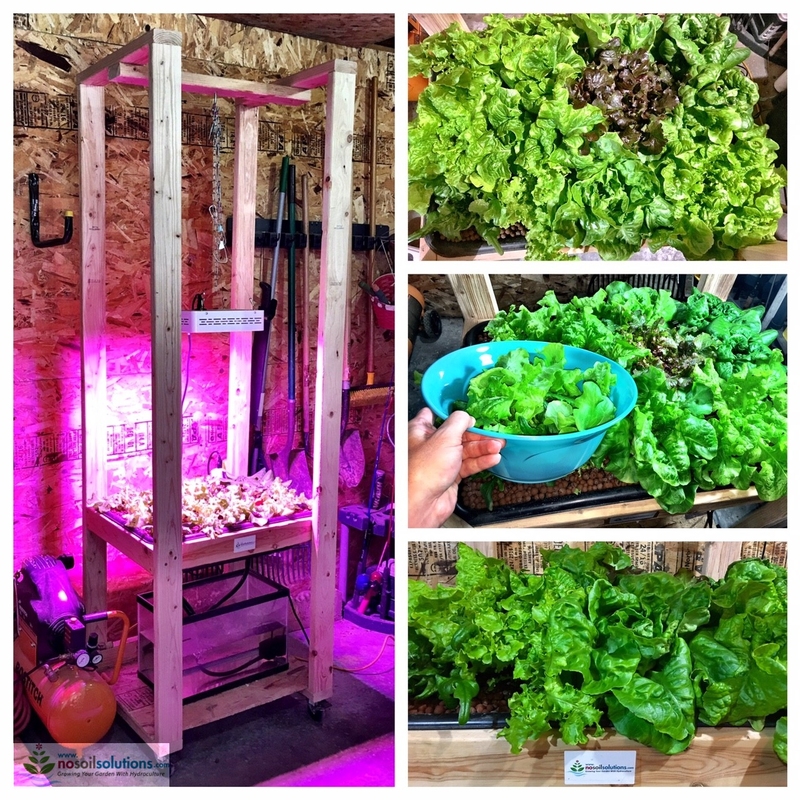 In my 2 ft. x 3 ft. ebb and flow garage system above, I was able to have a salad at about 3 weeks. You cut from a couple of plants one day, another couple the next, spacing out and extending your harvest. Below are some pictures of the hydroponic lettuce flood and drain system I had in my garage. Sounds like you’re having a problem with root rot. Check out this article on how to save your plant from root rot.